A male and female cardinal share a tree on a winter day. I love seeing these birds against the snow, they brighten up the landscape! It looks like a series of small bird paintings is beginning to take shape. I have a number of 5"x7" white mats with a black inner border and they look great with these small paintings. I'm open to suggestions for birds to paint! 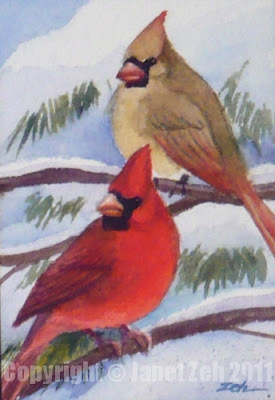 You can find Cardinals in Winter in my Etsy shop, JanetZeh.Etsy.com. Oh, I love cardinals! We just spent Christmas in Virginia, and a cardinal pair were regular visitors at the bird feeder. There were also a pair of downy woodpeckers, who were very keen on the suet feeder. I'd love to see you do a few woodpeckers like that, in a winter theme. There were also plenty of goldfinches, but in the winter they're more green than gold. But the chickadees are very striking with their black and white coloring. A nuthatch was spotted once, too, but he very seldom visited. Thanks Kessie, All of those birds are visitors to my feeders. I've put them down on my idea list. Love the downy woodpecker in winter idea.